Aside from being a part of an agency that is truly committed to making a difference in the community it serves, you’ll find that the career opportunities we offer are gratifying, provide ample chances for advancement, and offer competitive salaries and benefit packages. 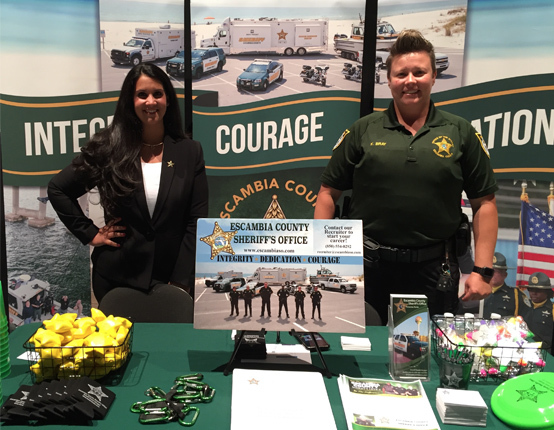 If you think you are up for the challenge and want to be a part of our team, we invite you to take a look at the positions we currently have available and consider joining the Escambia County Sheriff’s Office. Are you ready to make a difference? Meet with one of our recruiters to discuss your career! The ADA (Americans with Disability Act) Coordinator for the Escambia County Sheriff’s Office is Human Resources Manager, Dawn Brazwell. She can be reached at (850) 436-9444 or by mail, Escambia County Sheriff’s Office, Human Resources Division. The Escambia County Sheriff’s Office is an Equal Opportunity Employer & Drug Free Workplace.